The news just keeps coming from Mark Elliott at IYC, as he tells me he's signed the 45.72m motor yacht Encore (ex Magic) for charter. Built by Trinity Yachts in 1998 and refitted in 2004, she is MCA and ABS compliant and equipped with zero speed stabilisers. 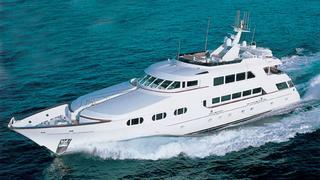 She features a Dee Robinson interior, and sleeps 10 guests in 5 staterooms, with accommodation for up to 10 crew. Currently in Newport, RI, she is available for charter in New England during the summer, and Florida and the Bahamas in winter.